After a few weeks, you would be asked to decide if you'd like to join and continue your training. At this point, you'll receive a uniform (karate gi) and a registration card. 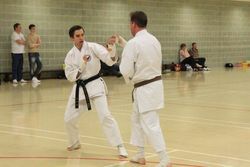 As you continue your training, you will have an opportunity to move up through the belt system towards your Black belt. To book a free trial class, please see the time table for all the available locations in East London. So, what are doing here?